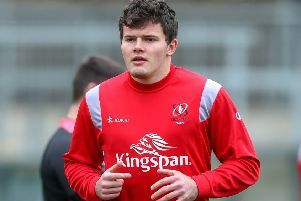 Ireland prop Marty Moore is hoping to bring the experienced he gained in the English Premiership with Wasps to Ulster. The tighthead spent two years with the Coventry based club after leaving his native Leinster and in spite of still having 12 months left on his contract Moore opted to move back to Irish shores and sign for Ulster. “I’d another year to go at Wasps and then I got a call last summer to say that there was interest here if I wanted to move back,” he explained. “It was good timing I was kind of feeling a bit like I wanted to be back in the Irish system and make a go of it and possibly internationally again. “We were also expecting our first child so family-wise it kind of made sense as well,” added Moore. “I suppose I know a lot of the guys as it is so that’s made things a lot easier. “The transition hasn’t been a wholly new venture and I know obviously a lot about Ulster from playing them and I know most of the guys throughout the coaching set up and playing staff. “Wasps were very accommodating, they were okay because if I was going to go to a competitor in the Premiership they would have had an issue with that. “The reasons would be pretty obvious but the fact that I wanted to come home effectively, they were very good and understanding and made the whole process as easy as possible so there were no issues there which was great because. Moore went on: “Every week’s a big learning week in the Premiership there’s no let up for (you). “It’s a very different type of league to the Pro14 as well so I feel like it’s been a great couple of years’ experience for me. Moore has been capped 10 times by Ireland but knows with Wiehahn Herbst, Rodney Ah Young and a few young props coming through he is not guaranteed his place in the front row. “I think we laugh and joke about it,” he said. “We’ve a lot of props in the squad, I think we have 10 props in the squad between loose and tight at the moment so there’s going to be a lot of competition but I think that’s the best way to be. Moore will have a quick reunion with his former Wasps team mates as Ulster travel to the Ricoh Arena tonight in their final pre-season friendly. “I just laughed because my family had been over at most home games my grandparents were over and always stayed in the hotel on site there at the Ricoh at the Hilton. They were kind of saying in April or May this is the last trip,” he said.